4 PAUTROT, Ferdinand, (French, 1832-1874): Bronze sculpture of two snipe, 11'' x 9'', signed Pautrot Paris 1866. 21 4 TERRIERS RATTING, OIL/CANVAS: In the style of George Armfield, 11'' x 13 1/2'', illegible possible signature lower right, gilded frame with minor wear, 16'' x 18 1/2''. 22 3 TERRIERS RATTING, OIL/CANVAS: In the style of George Armfield, 11'' x 13 1/2'', no visible signature, gilded frame with wear, 16'' x 18 1/2''. 24 19TH C PAINTED, CARVED AND GESSOED WOODEN ANGEL: 54'' tall overall. 27 HEMSLEY, William, (British, 1819-1893): ''The Birds Nest'', OIL/Canvas, 14'' x 12'', signed, encased in period gilded carved frame, 22 1/4'' x 20 1/4''. 30 SADDIER FRENCH ART DECO SCULPTURAL CHAIR: Period Deco wing chair, exotic veneer, original hand painted fabric. 35'' tall x 26 1/4'' wide x 24''. Unsigned. Provenance: Estate of and designed by Gertrude Maud Goldsmith, under the pseudonym G.M. de Marygny Denis, in the Paris Exposition of 1927. 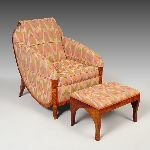 33 SADDIER FRENCH ART DECO CLUB CHAIR AND OTTOMAN: Rounded sculptural sides on the exotic zebra veneer frame, matching stool. Both in flame stitch fabric. Minor veneer loss. Chair is 32 1/2'' tall x 33'' deep x 25'' wide. Provenance: Estate of and designed by Gertrude Maud Goldsmith, under the pseudonym G.M. de Marygny Denis, in the Paris Exposition of 1927. 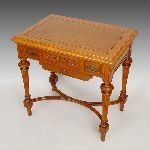 34 SADDIER FRENCH ART DECO BEDROOM SUITE: Beautiful burl wood capturing the look of tortoise shell, carved panels, and step detail add to the Art Deco look. Set includes the 4 door wardrobe / armoire, 63'' long x 83'' x 18''. The free standing headboard, 70'' wide x 46 1/2'' tall x 15'' deep. Pair of nightstands, with worn leather insert tops, 30 1/2'' tall x 19'' x 28''. Bears the ''Saddier Paris France'' label. Provence: Belonged to Gertrude Maud Goldsmith. 38 WINE TASTING PAINTING SIGNED MULLER: Oil/Canvas, 22'' x 27'', signed lower right Muller, encased in gilded liner with wear, 27'' x 32''. 41 LARGE NEOCLASSICAL STILL LIFE OF FLOWERS AND PEACOCK: Oil/Canvas, 36'' x 27'', no visible signature, encased in a carved impressionist frame, 41'' x 32''. 45 VENETIAN SCHOOL PAINTING 1854: Oil/Canvas, 20 1/2'' x 32'', illegibly signed S.Billetto? lower right, encased in heavy, thick, carved wooden frame with wear, 27 1/2'' x 40''. 47 DUVIEUX, Henri, (French,1855-1882): Venice Canal Scene, OIL/Canvas mounted on Board, 5 1/4'' x 7 1/8'', signed lower left, unframed. 49 VENETIAN CANAL SCENE, ST MARKS SQUARE WITH GONDOLIER: Watercolor heightened by white, 14 1/2'' x 7 1/2'', signed lower right, encased in burl wood veneered frame, 19'' x 11 3/4''.